Please remember to do a copy of the hair before to proceed. For undelivered purchases please visit our redelivery terminal in Main Store:. Tableau Vivant is excited to be part of the Xiasumi School and in the latest round of Enchantment. First Up – a new skin for the gents. 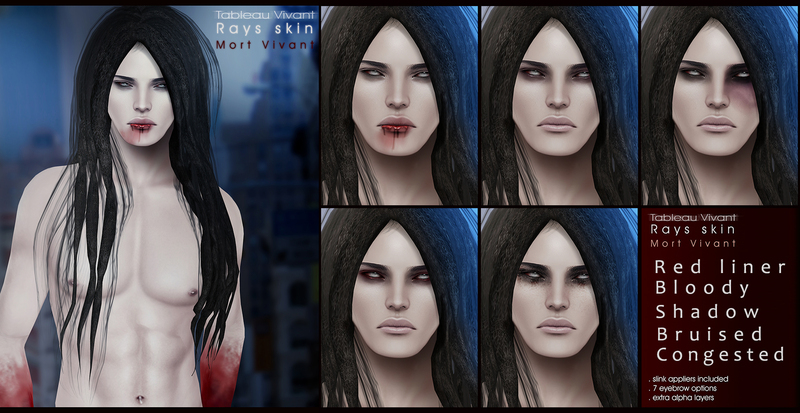 Rays is located in the Haunted House section of the event and to honor the super scary haunted house, we are back with Mort Vivant, one of our special skin tones. Available in 5 different options; Red Liner, Bloodied, Shadow, Bruised and Congested. Now on to the hair and accessories. We are happy to have a new style for our Aidoru Series, a special Asiatic line. This time we were inspired by Yui Mizuno, one of the idols of the girl groups Babymetal and Sakura Gakuin. Yuimetal comes in rigged and unrigged versions, both with detachable headband with 12 presets (6 for ribbons and 6 for ruffles). – 1 HUD with 30 tint options + accessory control. Please note, you can’t detach the ponytails ribbons! The maid headband can be purchased as separate accessory to be worn with any hair. Last but not least – the Enchantment event! Enchantment is a quarterly event, that focuses on a different fairy tale each round. This round focuses on Rumpelstiltskin. 20 stores participate and each store will have special releases inspired by Rumpelstiltskin in their shop for sale. Each item will also include a stamp card. Once filled with all the stores stamps you can then proceed to the prize location and redeem one card for any prize of your choosing! We have a new addition the Dreads Line – Rumple. Rumple is a unisex style that comes with three sizes in each pack, it is a a rigged hair and cannot be resized, also included is a hud with 16 different color options as well as RGB options so you can make your favorite tint and save it. Separately you can purchase the Rumple horns that are an unrigged mesh accessory, modifiable and available in 5 different colors. If you use your stamp card, fill it out in its entirety by going to each of the 20 stores you will be able to tp to the prize location and pick up the Milly hair which has hair color huds for basics, blondes, vivids and pastels. 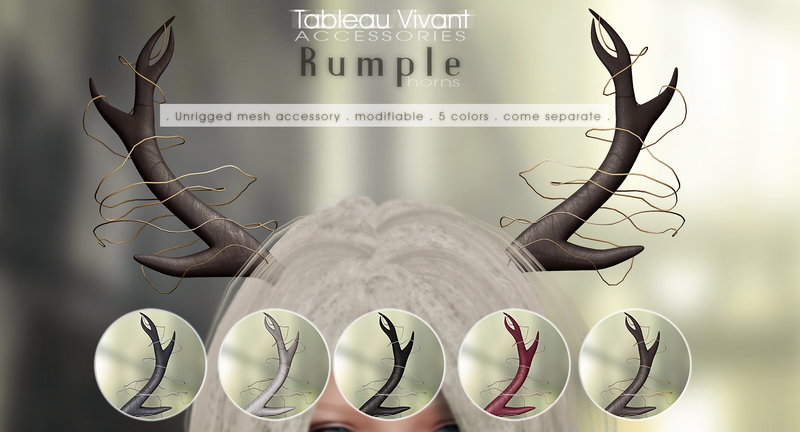 Remember, you can pick up Rumple Hair and the Rumple Horns at our main Tableau Vivant Hair store location. Each of them has one card inside which when stamped completely will each redeem one prize. We really hope you enjoy everything we bring to you as much as we have enjoyed creating it.